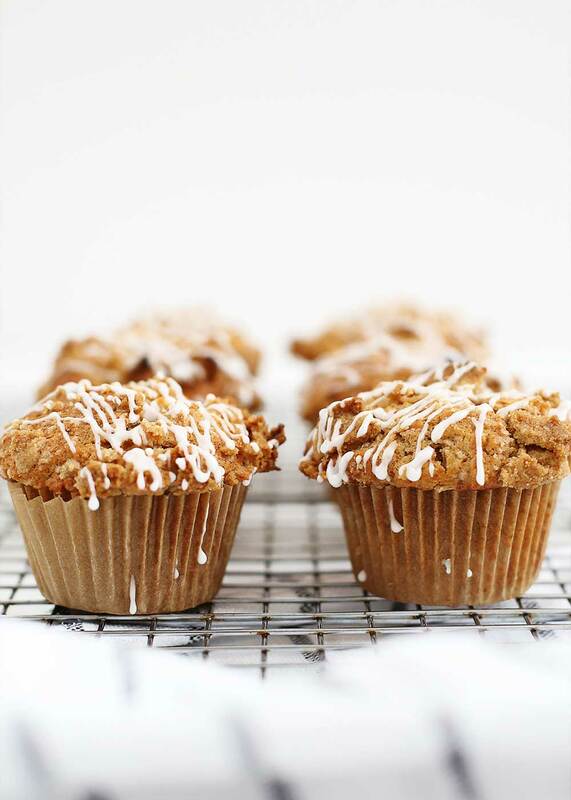 These Apple Crumb Muffins are a nice introduction into fall baking. Make the night before for an easy breakfast. Use a sturdy, sweet apple and grate it as you would a block of cheese. The glaze is optional, but don't skip the crumble if you can help it! Preheat oven to 400°F degrees. Line muffin tin with parchment paper. Set aside. Assemble the crumble. Place all the crumble ingredients together in a small bowl. Set aside. Begin preparing the wet ingredients. In a small saucepan, melt butter on low until half melted. Set aside to continue melting and cooling. In a medium mixing bowl, stir together all the dry ingredients. To the melted butter, whisk in all the remaining wet ingredients, except for the apples, until evenly combined. Grate apples as you'd grate cheese. Add apples and the wet mixture into the dry mixture, and stir until just combined. Using a 2-ounce spring release scoop, evenly distribute batter in prepared tin. Using your hands, mix together crumble until a loose cohesion forms. Top the muffins with the crumble. Bake for 16 to 18 minutes or until the center is firm to the touch. Allow to cool for at least 10 minutes before glazing. Make the glaze. In a small bowl, stir together all the glaze ingredients until smooth. Pour into a ziplock bag. Cut a tiny corner off the end of the bag and pipe glaze in a back and forth motion. Allow to harden before serving. Muffins are best after a rest. Make the night before for an easy morning breakfast. Store in a loosely covered container, allowing just a little air to get in for up to 4 days.